The mission of the Chamber of Commerce is to focus on advancing the economic success of our member businesses and supporting the economic development of the Johnston community. Active involvement in Chamber events and activities gives you and your business enhanced public visibility, networking opportunities, and exposure to potential clients, customers, and connections. 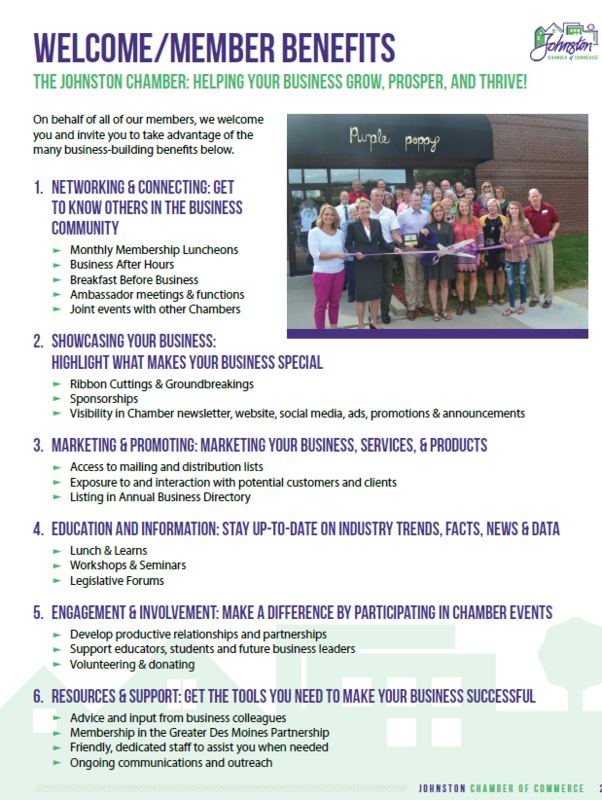 As a benefit of membership, members can market and promote their business through the Chamber. Members can utilize the Chamber’s targeted marketing opportunities to get the word out about their special event, announcements, or job posting. Due to limited space, there is a MAX of 2 spots available per weekly newsletter- 1 large spot, 1 small spot. Members can purchase 1 spot for an entire month if they choose. Spots are sold on a first come serve basis. Members can seek to reserve their spots by emailing thrive@johnstonchamber.com. Artwork/Imagery and text are the responsibility of the sponsoring business. Within the newsletter spot there is space available for both an image and text. The dimensions of a large spot is 500 pixels x 250 pixels for the image and 200 characters for the text­­­­­­­­­. The dimensions of a small spot are 200 pixels x 300 pixels for the image and 100 characters for the text. Please send your artwork/imagery in the form of a .jpg and accompanying text in a word document. Members can also take advantage of email marketing opportunities through the Chamber. Members can sponsor an individualized promotional email through the Chamber for $100 per email. Emails sent out through the Chamber’s distribution list reach nearly 950 inboxes. A purchased email will clearly indicate in the subject line that it is a “Paid Sponsorship” email. Artwork, design and text is responsibility of member. Images should be sent in PDF format. Text should be sent in an accompanying Word document. Text is limited to 250 characters. Email sponsorships are sold on a first come first serve basis. Sponsored emails will be sent 2 per month. Members can submit requests for their email sponsorships to: thrive@johnstonchamber.com. The image dimensions in an email are 400 pixels by 600 pixels. Non members can sponsor an email at a rate of $200. Following is the current dues structure for annual membership.